In this article, I'd like to focus on managed mode and show some improvements in that area that will make managed KIE Server ready for the cloud. This configuration fits nicely in non restricted environment where both controller and KIE Server(s) don't have any limitations to talk to each other. 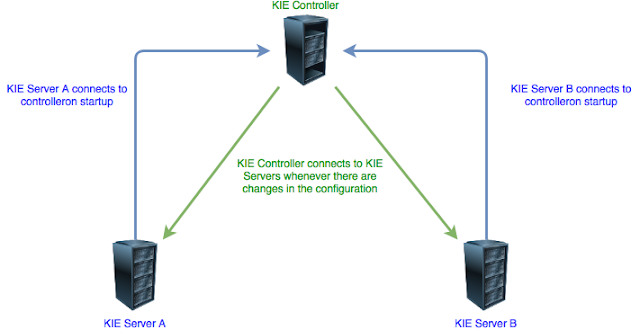 Though it does require that user name and password used by controller to connect to kie servers is the same as it is set globally via system properties and thus will be used whenever talking to any KIE Server instance. Though this setup can become problematic if there are any restrictions between these two. In some cases controller might be hidden behind firewall. That will then make an issue for it to communicate with KIE Server(s) when needed. Similar this becomes an issue in OpenShift environment where controller and KIE Server(s) are in different namespaces - they won't see each other internal IP. The location of the KIE Server is expected to be unique - since this is an URL where the actual instance is accessible. Though this becomes an issue when running kie servers behind load balancer or when running in a cloud based environments. It puts us in situation that we either give load balancer URL and by that loose the capabilities of receiving updates from controller (as only one of them will get updates based on load balancer selection) or we bypass load balancer and then loose the capabilities of it for runtime operations. Keep in mind that the location that kie server does provide on connection to controller is then used by (so called) runtime views in workbench - process instances, tasks, etc. In OpenShift environment that is pretty much the same issue - either public IP is provided which completely hides the individual PODs or internal IP of the POD. It has the same consequences as load balancer with one addition - internal IP won't work at all across namespaces. To resolve all the issues mentioned above, an alternative (and soon to be the default) way of communicating between KIE Server and Controller was introduced. It is based on Websockets that is now available in pretty much any JEE container (including servlet container) and solves pretty much all the issues that were identified for both on premise and in the cloud. As illustrated on the diagram above, KIE Server is the one who initiate the communication and keeps it active as long as it's alive. 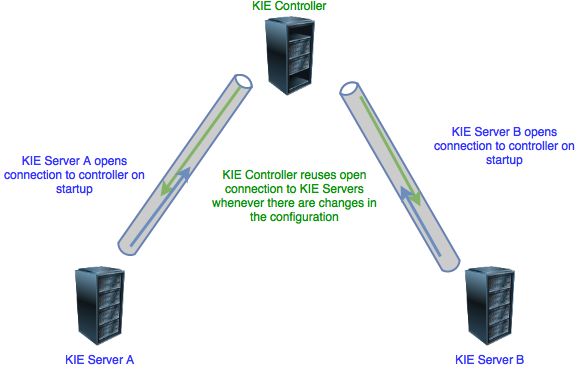 That in turn removes any need from KIE Controller to know how to communicate (and by that connect to) with KIE Server instances. So there is no more need to configure any user name or password on controller jvm to talk to KIE Servers, it will simply reuse open channel to connected KIE Servers. KIE Server is solely responsible for the connection. That means it needs to know where the controller is, how to authenticate when opening connection and how to handle lost connection (e.g. when controller goes down). Lost connections are handled by retry mechanism - as soon as KIE Server gets notification that the connection is closed it will start a background thread that will attempt to connect to controller every 10 seconds. Once it is reconnected that thread is terminated. It will reconnect only if the KIE Server itself is not the one who closed the connection. Since we keep connection open between kie servers and kie controller then the location given when kie server connects does not have to be unique any more. That solves the issue with running behind load balancer or in OpenShift with different namespaces. System property that provides location (org.kie.server.location) should now be given as the load balancer or public IP in OpenShift. NOTE: If you don't run behind load balancer on on-premise setup (not OpenShift) then keep the location of the kie server unique regardless of the websocket being used. Similar rule applies - same public IP/load balancer should be kept for single server template only. There is no need for any extra configuration to enable websocket based communication, it is based only on the actual URL given as controller url - org.kie.server.controller system property. Both protocols - HTTP/REST and Websocket are active by default and either of them can be used. Though one rule must be kept - use single protocol for all kie servers of given server template. Recommended is to keep single protocol across all kie servers connected to single controller. All other operations, like getting user tasks, getting process definitions or instances, will use regular REST based communication as it will call endpoints on behalf of logged in user to enforce security.